Control Panels - The Heart of Manufacturing Sites. Will continue to achieve a control panel evolution and process innovation through many undertakings starting with the shared Value Design for Panel concept for the specifications of products used in control panels. consumption H3DT-F At 240 VAC: 1.9VA max., at 240 VDC: 0.6W max., at 24 VDC: 0.3W max. 0.1 A max. at 125 VDC with L/R of 7 ms. 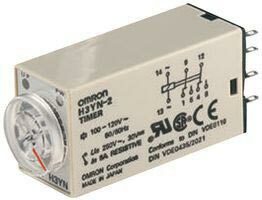 The minimum applicable load is 10 mA at 5 VDC (P reference value). 2,900 VAC 50/60 Hz for 1 min. 2,000 VAC 50/60 Hz for 1 min.